A cloud service has three distinct characteristics that differentiate it from traditional web hosting. It is sold on demand, typically by the minute or the hour; it is elastic -- a user can have as much or as little of a service as they want at any given time; and the service is fully managed by the provider (the consumer needs nothing but a personal computer and Internet access). Significant innovations in virtualization and distributed computing, as well as improved access to high-speed Internet, have accelerated interest in cloud computing. Private cloud services are delivered from a business's data center to internal users. This model offers the versatility and convenience of the cloud, while preserving the management, control and security common to local data centers. Internal users may or may not be billed for services through IT chargeback. Common private cloud technologies and vendors include VMware and OpenStack. In the public cloud model, a third-party cloud service provider delivers the cloud service over the internet. Public cloud services are sold on demand, typically by the minute or hour, though long-term commitments are available for many services. Customers only pay for the CPU cycles, storage or bandwidth they consume. 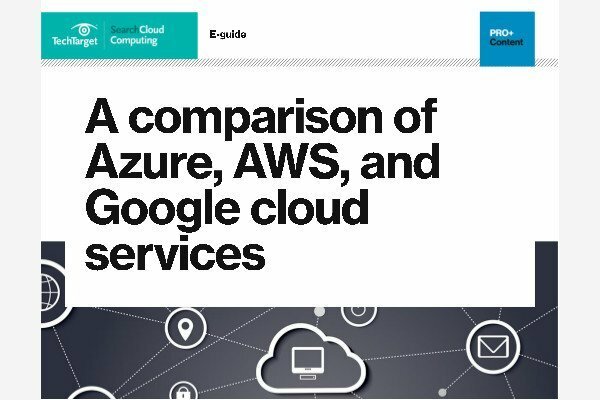 Leading public cloud service providers include Amazon Web Services (AWS), Microsoft Azure, IBM and Google Cloud Platform. In addition, organizations are increasingly embracing a multicloud model, or the use of multiple infrastructure-as-a-service providers. This enables applications to migrate between different cloud providers or to even operate concurrently across two or more cloud providers. Organizations adopt multicloud for various reasons. For example, they could do so to minimize the risk of a cloud service outage or to take advantage of more competitive pricing from a particular provider. Multicloud implementation and application development can be a challenge because of the differences between cloud providers' services and application program interfaces (APIs). Multicloud deployments should become easier, however, as providers' services and APIs converge and become more homogeneous through industry initiatives such as the Open Cloud Computing Interface. Workload resilience: Cloud service providers often implement redundant resources to ensure resilient storage and to keep users' important workloads running -- often across multiple global regions. Migration flexibility: Organizations can move certain workloads to or from the cloud -- or to different cloud platforms -- as desired or automatically for better cost savings or to use new services as they emerge. IaaS providers, such as AWS, supply a virtual server instance and storage, as well as APIs that enable users to migrate workloads to a VM. Users have an allocated storage capacity and can start, stop, access and configure the VM and storage as desired. IaaS providers offer small, medium, large, extra-large and memory- or compute-optimized instances, in addition to customized instances, for various workload needs. In the PaaS model, cloud providers host development tools on their infrastructures. Users access these tools over the internet using APIs, web portals or gateway software. PaaS is used for general software development, and many PaaS providers host the software after it's developed. Common PaaS providers include Salesforce's Force.com, AWS Elastic Beanstalk and Google App Engine. SaaS is a distribution model that delivers software applications over the internet; these applications are often called web services. Users can access SaaS applications and services from any location using a computer or mobile device that has internet access. One common example of a SaaS application is Microsoft Office 365 for productivity and email services. For example, serverless, or event-driven computing is a cloud service that executes specific functions, such as image processing and database updates. Traditional cloud deployments require users to establish a compute instance and load code into that instance. Then, the user decides how long to run -- and pay for -- that instance. With serverless computing, developers simply create code, and the cloud provider loads and executes that code in response to real-world events, so users don't have to worry about the server or instance aspect of the cloud deployment. Users only pay for the number of transactions that the function executes. AWS Lambda, Google Cloud Functions and Azure Functions are examples of serverless computing services. Which application integration strategy is right for you? What are the biggest benefits and challenges your organization has faced when using cloud computing services? A Playbook for Overcoming Multi-Cloud Challenges –Cisco Systems, Inc.
its very useful to us. thanks for giving this type of information.i need a doubt atpresent what is the feture of cloud computing in I.T sector? Its articles like this that confuse the matter even further. Cloud services is an on demand easily accessible set of resources which is scalable. It does not have to be Internet facing nor is just built on the three strands - one area which is missed out is ITaaS which enables businesses to deliver these scalable solutions themselves without having to pay out needlessly. Cloud computing is nothing more than what we had in the 70's but then it was called TSO (Time Sharing Option). Thank goodness someone remembered the time sharing schemes that were prominent in the mainframe/mini-computer era. And your right, the "Cloud" et al. is nothing more than the client/server version of the old timeshare. They both sought/seek to maximize the use of expensive resources while minimizing (in theory) costs, though I question whether the "Cloud" model really saves that much money. Indeed, I suspect that many firms are thinking, "you guys are charging us WHAT?" Or they have wholly legitimate concerns about security. It's hard enough to keep up with THAT problem on your own. Now the computer systems related terminologies has become difficult to determine the first time my eyes goes on those words!!! wouldn't cloud computing make it easy to implement government regulations that can destroy businesses around the world? it is my first time of actually taking time to find out what cloud computing is about in terms of definition and component. I am truly impressed with your explanations. it is clear and contains the essentials. thank you. Folks, if you remember the mainframe age, exactly we are going back to that age... This is what could computing is..
Great Post! It explains all the basics in a nice and short summary. Ok, a nice article but it doesn't answer the question the article poses: "What is Cloud Computing?" Very true. I agree that elasticity and centralized control are what distinguish cloud computing from traditional hosting. Enterprises of all types and sizes are finding the cloud a safe and cost-effective option for managed IT support. One of the major reasons for such high levels of trust is the ability to use and pay for only as much service as required. Companies know that they will be paying for what they want. Plus, when it comes to security, the cloud is way more efficient compared to traditional IT models! for what process cloud computing used for? Basically It is a method of configuring servers in a flexible way to allow for the most affordable, scalable, and reliable web infrastructure. Cloud computing has found its prominence owing to many benefits that it provides. It will be really appreciable for most of us if we concentrate on the result rather than the efforts. Cloud does the exact. The major requirement remains a greater bandwidth. It is very clear and great description about cloud hosting. This is very good for the people who want to know more about cloud computing.Cloud is one technological model that assures data backup and disaster recovery solutions to the users. It explain very well and I hope people understand, Public cloud is good for temporary use, No one want to use Public cloud 24/7-365 days and pay lot on money to vendor. If you need server for your Dev/test, it is good to use public cloud but for your company major applications/Databases/Financial data still required Private cloud (Company Own Data Center). Good to go for Hybrid cloud. What are the biggest benefits and challenges your organization has faced while using cloud computing services? i think it will be a threat to jobs of IT administrators.. Cloud computing always helps to Small and Medium businessman who have not more money to hire any accountant for manage our accounting works. Cloud computing have more of more advantages in which cost effective hosting services, reliable hosting, more flexible and data security are coming. These advantages are make it special to another type hosting services. How safe is it to keep the information/records in cloud computing? it is very helpful to us. thank you. Wonderful Information about Cloud computing.